The Flash is not your average superhero TV show, says Paloma Sharma. The Flash made its debut on Indian television on Colours Infinity recently. 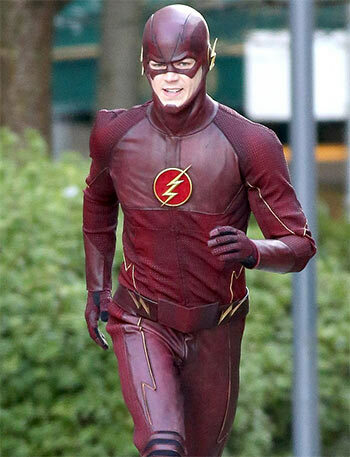 The Arrow spin-off follows the journey of Barry Allen (Grant Gustin) from the age of 11, when his father is wrongfully convicted for his mother's murder, to age 25, when he is struck by lightening and becomes a mask and latex-clad sporting hero. The first episode opens with Barry rushing to work, which, in a way, is symbolic of his general attitude towards life -- he'd rather run away than deal with stuff. We learn that Barry, a forensic investigator, is perpetually late and his adoptive father Joe West (Jesse L Martin), a detective with the Central City Police Department, continually covers for him. Joe's daughter, Iris (Candice Patton), grew up with Barry and is absolutely oblivious of his feelings for her. She thinks of him as a brother. The two attend the unveiling of Dr Harrison Wells' (Tom Cavanagh) particle accelator which, due to a thunder storm, goes awry. The particle accelator bursts, causing widespread destruction. As the energies from the particle accelator spread over the city, Barry gets struck by lightening, causing him to go into a coma. When he wakes up, he is in the care of Dr Wells and his team, that is, Dr Caitlin Snow (Danielle Panabaker) and Cisco Ramon (Carlos Velde), and has gained the power to run faster than the speed of sound. Eager to use his superpowers for good, Barry, in his naïvety, forgets that he wasn't the only one who was affected by the particle accelator's explosion. He soon finds out that there are several like him out there, but unlike him, not all of them want to use their powers for good. The beauty of The Flash is that it would interest anyone from ages five to 55. It had seemed for a while that writers, directors and producers had forgotten how to have fun with the genre. The Flash, however, has no caped crusaders speaking in low growls or men with dark secrets who are searching for their place in the world. It simply has well written characters, an interesting new villain in every episode, a well structured story and neat cinematography and that is enough. Of course, tragedy strikes in this story as well, but writers/producers Greg Berlanti, Andrew Kreisberg and Geoff Johns balance it out with touches of humour. The show starts out as an example of predictable programming because anybody who knows the prototype of your basic superhero character will be able to predict the first 20 minutes of the first episode. But after that, The Flash won't let you down. Episodes run for between 40-45 minutes on an average and though Colours Infinity shows three of them back to back, with a show like The Flash, it isn't nearly enough.